A few years ago, I went through a long bout of fatigue. And, I’m talkin’ bone-tired, 24/7 kind-of-fatigue. During that time, I did a lot of exploring “under the hood” with my Integrative, M.D. One possibility we looked into was Epstein-Barr virus. Ever since, I’ve been wanting to talk with you about this incredibly common infection. Well, today’s that day. Epstein-Barr virus (EBV) is part of the herpesvirus family. Other infections in this family include herpes, shingles and chickenpox. Mononucleosis (aka mono or the “Kissing Disease”) is probably the most commonly-known way EBV manifests itself. You might be surprised to learn that up to ninety-five percent of the population is infected with EBV. It’s just that the majority of these people are going through life as carriers. Typically, carriers are symptomless (the virus just hangs around—dormant). The problem is, if the virus reactivates (we’ll talk about that in a moment! ), it’s a real drag. You’re exhausted, achy and feel under the weather—all the time. Are you experiencing fatigue that no amount of sleep, nourishing food, exercise or caffeine can shake? Do you often come down with persistent “flu-like” symptoms? If this is the case and you haven’t been able to get to the root of the issue, you may want to look into EBV with your doctor. To help us understand EBV, I’ve turned to our fabulous friend, Doctor Aviva Romm. Aviva is a Yale-trained M.D. and Board Certified family physician, midwife and herbalist who is focused on helping women not only heal their bodies and minds, but transform their lives. Her upcoming book, which covers Epstein-Barr virus, is called The Adrenal Thyroid Revolution. Kris: How is EBV infection transmitted and how prevalent is it? Aviva: EBV is transmitted through intimate contact, which includes “sharing” saliva (this can happen through drinking out of the same cups, kissing or passing joints or cigarettes). It’s highly prevalent. As you read above, about ninety-five percent of people worldwide have been infected with the virus. Kris: Who is most likely to be infected by EBV and how is it diagnosed? Aviva: Anyone can become infected by EBV. Symptomatic infections with mono seem to be most common in the late teenage years and early 20’s. Most of us have been exposed and are asymptomatic carriers by our adult lives. Women going through major life changes, including the death of a loved one, a major move or job change or menopause, for example, may be particularly susceptible to reactivation of the virus, and therefore a symptomatic infection. 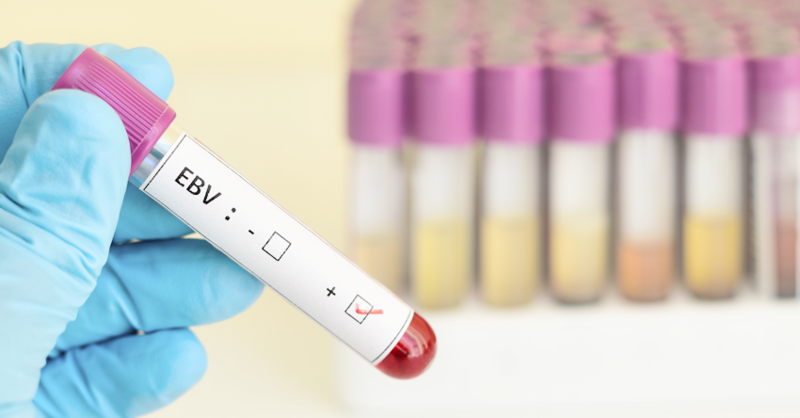 To diagnose, your healthcare practitioner can do an Epstein-Barr Virus Panel to include: Viral capsid antigen (VCA)-IgM, VCA-IgG, D early antigen (EA-D) and Epstein-Barr nuclear antigen (EBNA). Kris: What is EBV reactivation and what are its symptoms? Aviva: EBV reactivation can persist for months, much like mono can, though it’s usually significantly milder. Reactivation of the virus often happens in times of prolonged stress. Symptoms typically include fatigue, which can be quite intense, aching muscles and joints, swollen lymph nodes and other persistent flu-like symptoms. It can also cause malaise and even depression. A physical exam may find a swollen liver and spleen, and liver function tests may be abnormal. Kris: What is chronic EBV infection and what are the signs and symptoms? Aviva: While chronic EBV infection is considered rare, the symptoms are similar to those with reactivation, and may be mild to severe. Although, liver and spleen abnormalities may be not be observable or found in this case. Chronic EBV occurs when the infection remains persistent rather than going dormant, as it should when the immune system is able to keep it under wraps. Kris: Has EBV been connected to any other health issues, like cancer or autoimmune disease? Aviva: EBV has been associated with numerous autoimmune conditions, from Lupus to Hashimoto’s thyroiditis, and is also associated with certain lymphomas (types of cancer affecting B-cells of the immune system). Kris: What treatments are available for EBV infection (conventional and holistic)? Aviva: While supportive treatments are available for mono, no specific conventional medical treatments have been established for treating recurrent or chronic EBV. Many holistic doctors use an antiviral medication called Acycovir, which is also used in the treatment of herpes and shingles. While this treatment is considered “off label”, meaning not intended for this purpose, patients have reported that it helps with symptoms and shortens the duration of their illnesses. It is also considered relatively safe. Kris: What plant-based foods, herbs and supplements would you recommend to prevent and treat EBV infection? Aviva: In my medical practice, I emphasize good nutrition, healthy sleep habits and relaxation techniques to keep the immune system in optimal condition, along with smart basic hygiene practices. I also love the adaptogen herbs, such as ashwagandha, holy basil and reishi for general immune support (see my blog for more on this). *All can be taken daily for up to 3 months. Please check with your healthcare practitioner before adding new supplements to your life. Zinc Citrate: Immune supportive; in excess of 60 mg/day can be toxic. Take 30-60 mg with food daily to avoid nausea. St John’s Wort: Antiviral and relieves depression. Take 300-600 mg/day of products standardized to 0.3% hypericin and/or 3-5% hyperforin. Lemon Balm: Antiviral and relieves stress and anxiety. Take 300-1200 mg daily in tea or capsules, or 40-60 drops of tincture 1 to 3 times daily. Licorice: Antiviral, anti-inflammatory and an adaptogen. Take 150-300 mg daily. Echinacea: Anti-inflammatory and antiviral. Take 300-500 mg up to three times daily.